Having dallied at Waterloo with this company's most recent game, I've now returned to their first production from which the company takes its name. Despite, its title specifically containing the word Trafalgar, the assumption with naval games tends to be that they will be of a more generic type. But this really does give you the battle of Trafalgar, with a set-up map in colour to denote the positions of all the ships and two and a half pages of stats. 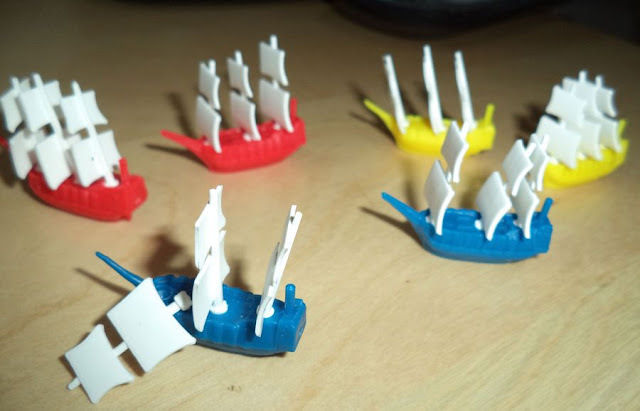 It was this factor that first intrigued me as to how so many ships would be handled, especially as all that I'd seen and read about this a game suggested a miniatures treatment not unlike Waterloo 1815, except with plastic model ships. Here they are en masse, red British, blue French and yellow for the Spanish. These are accompanied by sets of three masts and sails for each ship. There is a substantial amount of work to be done here if you are going to move beyond the simple basic form.that you see below. There is also one more physical problem that I have encountered that is illustrated here too and that is the masts. First of all the size of everything is small -from tip of the bowsprit to stern, each ship is a mere three and a half cms long. So, handling is a delicate affair, with the masts as the obvious point to pick the ship up by, but these are meant to remain simply pushed into the small retaining holes in the deck. There is an excellent reason for this: namely that combat can cause individual masts to be damaged and laid to one side of the ship or the other as seen in the picture. Rules cover this, including the effect on the ship's speed and the ability to carry out repairs later. The concept is first rate - very visual, very emotive, but - for me - very impractical. I've met with a series of problems. Unpainted I've found some masts too loose and some too large to fit into the holes. Consequently, masts topple, ships can't be picked up safely by their masts. Just fitting all three masts into a ship without causing one of them to fall out has eluded me. Solutions have been suggested, including using microscopic amounts of blu-tac and infinitesimal enlarging of the holes - none of these have I found adequate in dealing with the problem. Painting the ships simply added to the number of ships and masts causing me problems. Finally, to add to these physical difficulties is the stability of the ships themselves. They easily fall over, especially when you are manoeuvring so many in close proximity to each other. Excuse the pun, but all is definitely not plain sailing. For me the solution has been to adopt two modifications: the first is to base the ships that gives them immediate stability and makes them easy to pick up and move and adds a further level of visual appeal. It also allows you to fix the crucial adhesive flags [seen below] that display the ships nationality and the all important number for identifying each ship. The second is to glue the masts permanently onto the decks. This latter action may come as heresy to some gamers, but it instantly removes all the physical problems and the use of small numbered counters [borrowed from the many other games I own] is a simple substitute to keep track of damaged masts. Here you can see what I mean thanks to the efforts of Clay Stretch who has courteously allowed me to use his photograph displaying his far superior ability in painting and mounting the ships in the manner that I've chosen to do. This concern is the only one that I have about the contents of the game. 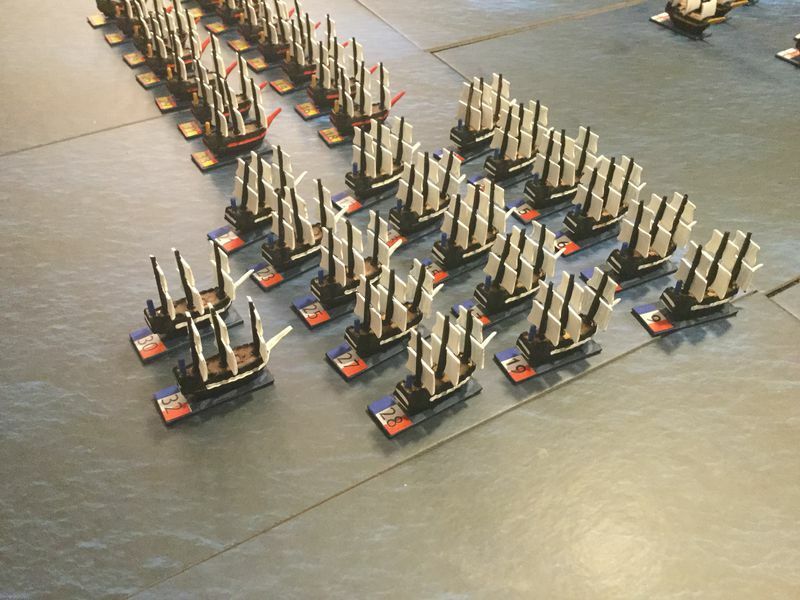 As with Waterloo 1815, the physical components are very nicely done with a vast array of markers and a superb set of player mats that present all the ships in the game with their related tracks on which to mark everything from hull damage to type of shot be loaded in the cannons. As you can imagine with the playing area plus the room needed to display all the ship displays, the footprint for this game is rather large. Not having a convenient games room, it takes my dining-room table fully extended to 1600 mm x 1010 mm to accommodate everything. With the number of ship displays comes a fair amount of book keeping, though handled very attractively and elegantly as illustrated by the one above. When playing the basic game, this involves very little per ship, but grows in complexity with the inclusion of the advanced rules. What surprised me, as this was the first of Trafalgar Editions games, is that the rule book is far better than the one for Waterloo 1815. The layout makes better use of white space, layout and font size, adding greater clarity to a set of rules that in themselves are very clearly explained. Complementing this is a separate booklet of examples with ample, if rather hazy, colour shots that takes you step by step through three turns of the basic rules pitting 4 ships per side. These basic rules consist of initiative, combat and movement. As with Waterloo 1815, movement is measured using small in increments of 1 UM standing for 1 Unit Marker.and, as I find with most naval games, this is extremely easy to handle, there being no considerations of terrain to take into account. Inertia, drifting, movement against the wind and the effect on speed because of compass bearing relative to the wind are covered well and for any that want a very simple start elements can be omitted. The one factor left out is changes both to wind direction and wind strength, which is understandable given the period of hours over which the battle plays out. However, to my satisfaction I quickly found that the Advanced Rules section included just that possibility and its minor effects coming in to play. Combat too is delightfully straightforward. A basic to hit number depending on range and if successful, roll on a damage table which gives Hull damage on rolls from 1-5 while a 6 lands a critical hit. Typical here are such hazards as a wounded officer, the rudder shot away, fires and damage to a mast. Boarding, grappling, ship surrender and capture all feature with straightforward economy of explanation and clarity giving a very playable set of basic rules. In the Advanced Rules are many small extras that I think many players will have little difficulty adding in almost from the start including collisions - highly likely with the many ships and especially if you can muster separate players for the French and Spanish ships. Variations in the wind I've already mentioned and is a must for me to use as is the option for different kinds of ammo loads covering the familiar grape-shot, chain shot and double rounds. Though not needed for the play of the game's battle, Trafalgar, I was pleased to see the inclusion of harbours and coastal batteries too, as I'm certain many of you will want just those very rules for your own scenarios. In fact, what I love to see from Trafalgar Editions would be some small expansions with other ship mats and scenario details. All in all Trafalgar 1805 is a very good addition to Napoleonic naval warfare with a strong touch of the miniatures world without some of the more complex and at times baffling elements that I've encountered in dense many paged rule books. The only downside for me has been the physical difficulties with the ships and masts already covered and I know that Trafalgar Editions are planning a set of resin ships which may just help,me out. Once again many thanks to Trafalgar Editions for the review copy and my apologies for the gremlins which every so often play havoc with the physical layout of the text! Nice... Will check it out. If you want the game, look at the website of the publisher, and any questions, we have a forum with videos and with questions resolved. We also answer in English, although the forum will be in Spanish.